The Sangean SG-622 (RadioShack DX-397) portable analog shortwave radio. 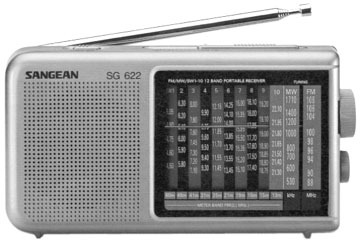 The Sangean SG-622 (a.k.a. RadioShack DX-397) is an analog AM, FM, shortwave radio. It is affordable, simple and surprisingly sensitive for the casual broadcast listener. The ten shortwave bands cover: 4.5-5.05, 5.8-6.3, 7.1-8, 9.3-9.9, 11.45-12.15, 13.40-14.05, 15.1-15.85, 17.4-18.1, 18.75-19.2 and 21.3-22.1 MHz. This entry was posted in Analog, Portables, RadioShack, Sangean and tagged DX-397, RadioShack, RadioShack DX-397, Sangean, Sangean SG-622, SG-622. Bookmark the permalink.